Thank you for the great feedback on our two new scone recipes! We’re also very excited about them along with our two kitchen tested Make Ahead Options. Tip: We’ve discovered that both options work very well with baking powder biscuits. Since we like to make our scones as close to tea party time as possible, the frozen option is our personal favorite. We’ve pretty much run our course, along with trying your patience, on scone postings, so next week join us for some teapot talk! For those who are wondering about the options, they are listed below for your convenience. They are also inserted in our recipes: Triple Chocolate Scones & World’s Best Scones Made Even Better. Make Ahead Option #1: After mixing your dry ingredients and add-ins (ie: dried fruit, chocolate chips, nuts, etc) seal this mix in an airtight container such as a plastic bag and store for up to 6 months in a cool, dry place. When ready to use, place mix in a large bowl and add the butter, milk and vanilla according to recipe directions. You’ll have tea & scones within a 1/2 hour if you multi-task on the tea. And this is also a great, inexpensive gift idea! Tip: Exclude moist add-ins such as fresh fruit or lemon zest until you are ready to make your scones. At that time, add them between cutting in the butter and adding the milk & vanilla. Make Ahead Option #2: After cutting your scones into desired shapes, place them on a cookie sheet and freeze. When completely frozen, wrap scones well in plastic wrap and foil or freezer bags. Well wrapped scones will keep at least one month. When ready to use, place frozen scones on a lightly greased cookie sheet and bake according to recipe. Do not thaw first or add additional baking time for small scones, however, large scones may require a few extra minutes. You’ll have scones in approximately 20 minutes! You’re invited to click Teapots ‘n More and browse our selection of english bone china teapots, tea accessories, tea cups, tea miniatures and bone china tea sets. As mentioned in our previous post, here is the recipe for Triple Chocolate Scones with two “Make Ahead” options. 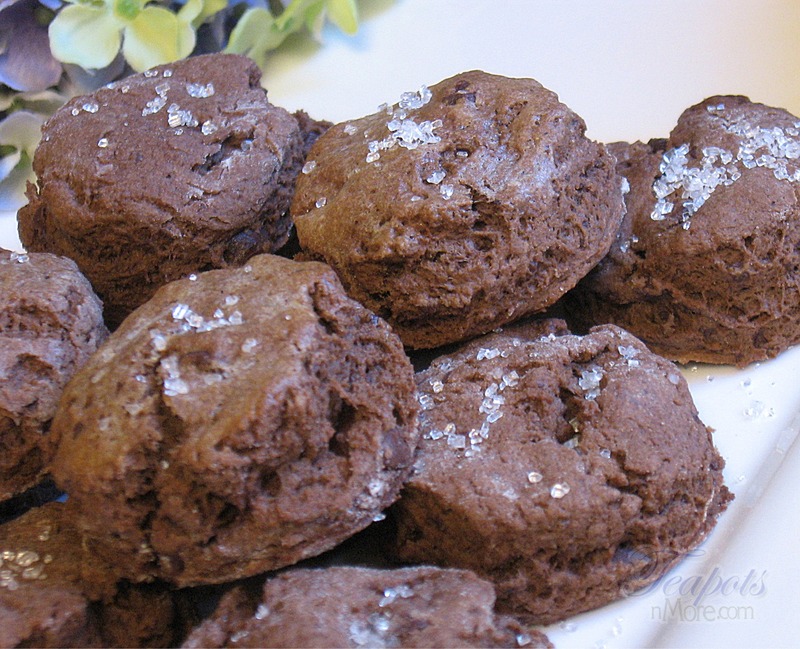 They’re a scrumptious treat for special days or when you need a little chocolate. We hope you enjoy this fresh approach to our favorite tea treat with “lashings of cream” and jam, as our british friends say. Makes 24 small scones, 1 1/4 inch (our favorite size) or 10-12 scones, 2 inch or 8-12 wedges. 1. Preheat oven to 400 degrees F. Sift together first 5 ingredients in a large bowl. Add the chocolate chips and dark chocolate. 2. Cut butter into dry ingredients until approximately the size of peas. 3. Measure vanilla into a small bowl and add milk. Pour most of the vanilla milk into dry mix and stir to moisten. Dough should be moist enough to form a soft ball, but not sticky. If needed, additional milk may be added 1-2 teaspoons at a time. 4. Turn dough onto a lightly floured cutting board and press out with hand to approximately 1/2 inch thickness.Tip: Do not knead dough and use as little flour as possible to keep the dough from sticking to the board. 5. Cut into desired shapes and place on a lightly greased baking sheet. Lightly brush tops with milk if desired. 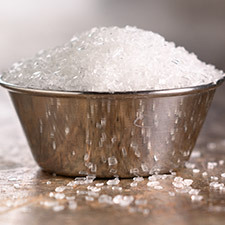 Sprinkle with raw sugar crystals or Sparkling White Sugar crystals such as those found at cake decorating supply stores or King Arthur Flour. 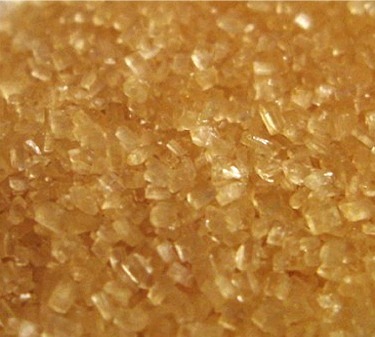 Raw sugar crystals can be found in the baking aisle of many grocery stores. Tip: If using a biscuit cutter or glass, dip the cutting edge in flour first. 6. Bake for 10-15 minutes depending on size. The 1 1/4 inch scone will be done in about 10 minutes. Sprinkle again with large sugar crystals while scones are still hot for visual appeal. Best served within 1 day of baking with butter or clotted cream and jam. Store in airtight container if serving later in the day. Tip: When baking, start checking your scones at the minimum baking time. You can always bake longer, but overdone is ruined. Tips for great scones: Scones are like biscuits. To get a tender, flaky scone, the dough should be handled as little as possible and you should always use cold butter and cold milk. This is an easy open face tea sandwich recipe that gives you a salty-sweet taste when garnished with thin slices of sweet gherkin pickle. We use square loaves of pumpernickel from our favorite bakery. If you don’t have square loaves available, use whatever you can find and cut your sandwiches in the shape that pleases you: squares, circles, diamonds or cookie cutter shapes. Our recipe is below the video which has some good visuals and tips for making tea sandwiches. We hope you enjoy this offering! 1. Discard end pieces of loaf. Thinly spread each slice with softened butter. Spread cheddar cheese in a fairly thin layer over butter. 3. Refrigerate these sandwiches in an airtight container, separating each layer with a sheet of wax paper. Before serving, garnish each triangle with 1 or 2 slices of sweet pickle. You’re invited to visit Teapots ‘n More for lovely english bone china teapots, tea accessories, tea cups, tea miniatures and bone china tea sets. Whether an impromptu kitchen tea or a fancy sit down affair, nothing brightens up the table like a little lace or linen! It transforms the table and signals to your guests that it’s time to take a breather…be comfortable…put a napkin in your lap…savor your conversation…really enjoy the delights of the hour. – Tea in the Living Room (comfy couch and chairs): Throw a small tablecloth or table runner on the coffee table to transform it. 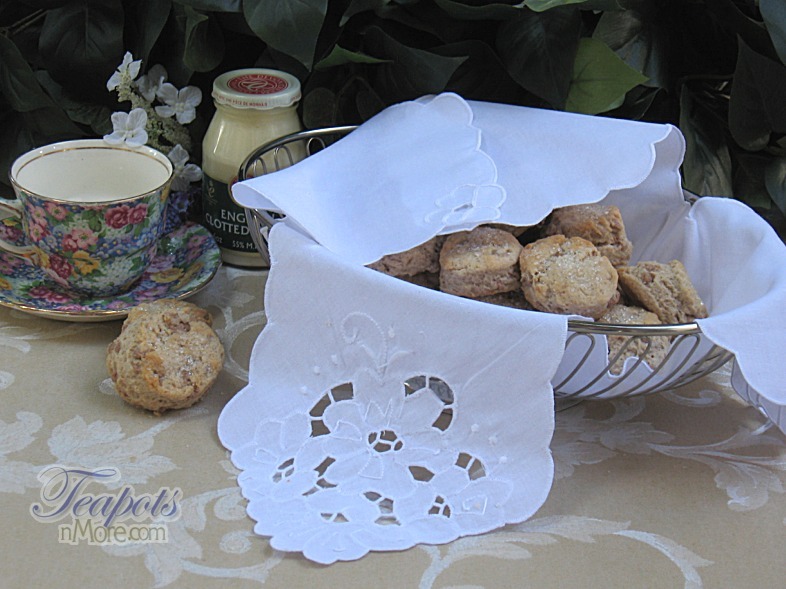 – Tea in the Kitchen: Put a tea cozy on the pot, a crocheted lace doily in the center and use cloth napkins. – Tea in the Dining Room: Fancy tablecloths are always lovely, but you can also make a little go a long way with lace. On a solid color tablecloth, use a lace table runner down the center. Another idea is to lay paper or crocheted lace doilies in an overlapping pattern down the center as a lace table runner. These can be all the same size or different sizes and shapes. 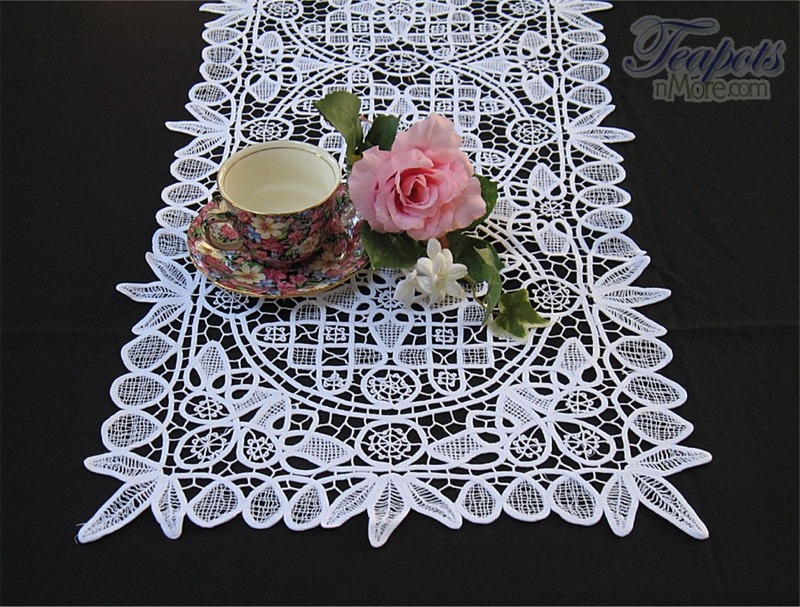 Large lace doilies also make for lovely placemats. – Tea in the Garden: Try a one color theme such as all white. Layer one or more white table cloths of different lengths, patterns or cloth types. Or introduce one pastel or vivid color layered between a white or cream tablecloth & table topper. 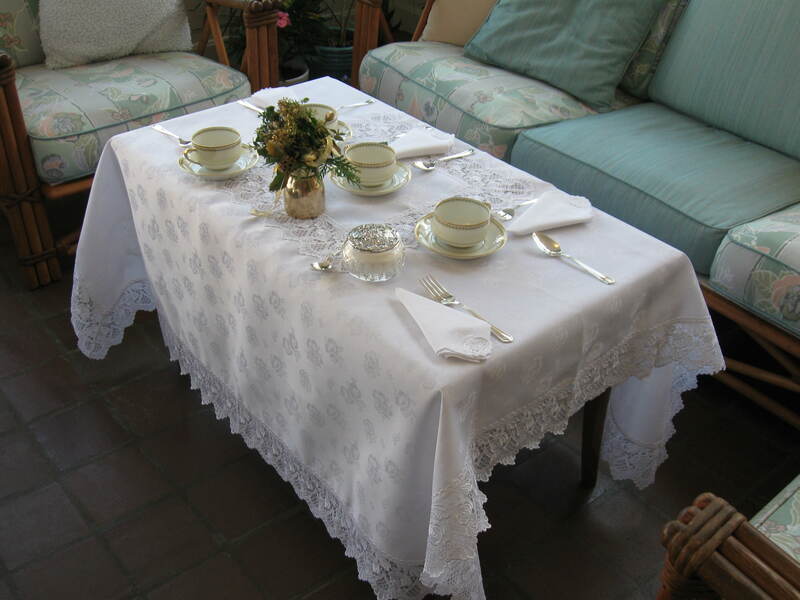 – Tea al Fresco (outdoors): Use a quilt either on an outdoor table or as a picnic blanket and add cloth napkins. If you’re so inclined and setting a table, a lace or linen table topper or tablerunner would look nice layered over the quilt. Wrap a pretty tea towel around your teapot instead of a tea cozy. Use a bun warmer for your scones or warm savories. Use a large lace pillow sham as a table topper. Try a patterned table cloth with a lace or solid colored topper. Make layers of table cloths with complimentary colored patterns and sizes such as a floral print, then strips or checks and lace on top. Whatever you do, you’ll be setting the stage for a lovely party! You’re invited to visit Teapots ‘n More and browse our selection of linens, teapots, tea accessories, teacups, tea miniatures, teas and more. Paper Doilies: The Decorating Wonder! Need a cheap, versatile decorating idea? Two words: Paper Doilies! We had an epiphany shopping at the local Walmart, which judging from the information already on the internet was late in coming! We needed doilies for store use and purchased a 24 pack of round paper doilies in three size (12″, 8″ & 6″) by Wilton for $2.00. Such a deal! That’s when we realized the awesome, cheap decorating power of the paper doily. Think about it. Need to decorate a cake? Paper doilies and powdered sugar. Decorate a table? Paper doilies. Place cards? Doilies. Invitations? Doilies! So, with a doily in hand for inspiration, here is a list of basic ideas as a springboard for your imagination and some links to ideas from other creative people. Please share your great ideas as well. If you’ve got a Walmart nearby, go for the Wilton Cakes display. I’ll bet you find paper doilies…the decorating wonder! If you can’t find paper doilies, here are some online resources: from Create For Less – 32 Assorted Round White Doilies for $1.94, from Kids Crafts Plus – 96 Assorted Round White Doilies for $7.45, from Sur La Table – 48 Assorted Square White Doilies for $9.95. We also noticed some good deals on Ebay and Etsy searching under Paper Doilies. 1. Decorate a cake with doilies. Lay a doily or doilies in a pattern on top of a dark cake such as chocolate, gingerbread or even brownies. Sift with powdered sugar and carefully lift doilies. For the prettiest look, be sure to use a doily that does not have a solid circle of paper in the middle. 2. Use large doilies as place mats under table settings. This is most effective on a colored tablecloth. 3. Dress up serving plates/trays with doilies or set off a special dessert with a doily. 4. Arrange different sized doilies on a colored tablecloth and cover with sheer fabric or tulle netting. 5. Take the same idea as above but make a doily table runner. 6. Use a doily as an invitation. 7. 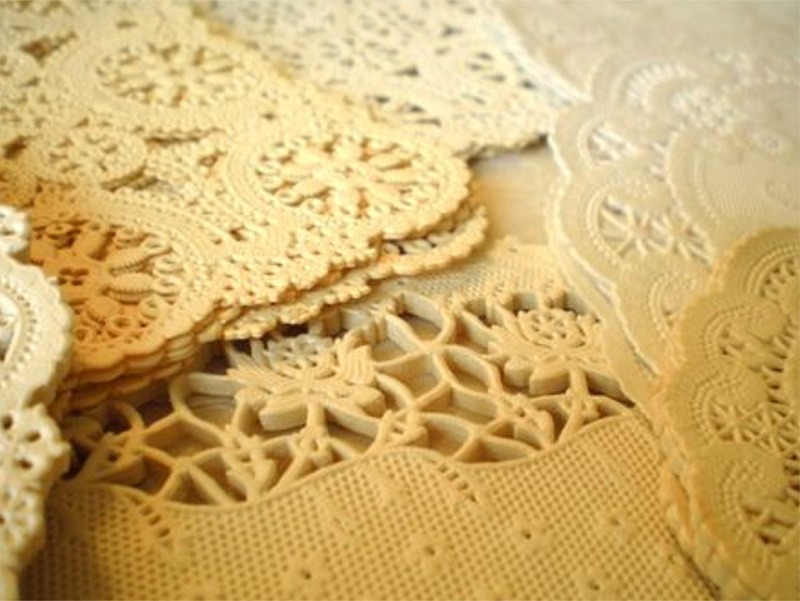 Dress up a paper napkin by folding it inside a doily. My thought here is to fold a square napkin in half lengthwise and fold a round doily in half. Then place the now rectangular napkin in the now half-round doily and give it all a good crease. 8. Use 4″ round doilies as place cards at each table setting. 9. Decorate small favor boxes with small doilies. 10. Make a luminary table decoration with white paper bags, candles, sand, paper doilies, glue and scissors. While your bag is still folded up, scallop the top edges with a scissor. Glue doilies on the inside of your bags making sure to glue all edges to the bag. When dry, add 1-2 inches of sand and votive candles or battery operated votive candles. Remember the safety of your guests: never leave a burning candle unattended. 11. Make a Paper Lace Garland – a charming idea from Project Wedding! 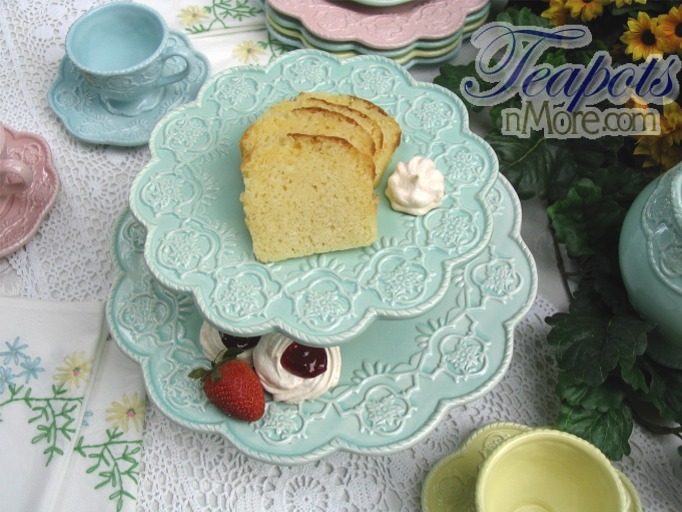 You’re invited to Teapots ‘n More for a look at our newest English Bone China Tea Sets, Teapots, Tea Accessories and much more! Roses and Cranberries: Get a clear glass vase with a mouth wider than the base. Fill it halfway with water. Add fresh cranberries. Add a large bouquet of flowers that are all one complimentary color such as white roses. Spanish moss or small round glass ornaments (silver or gold) around the exposed bulb. Surround the pot with small gift boxes wrapped in color matching paper and ribbon. This is very attractive in a grouping of 2 or 3. Color on Color: How about a white water pitcher and white roses, or red on red? Try your own combination. Tiered gifts: Use a three tiered plate as your decoration. Instead of cookies and sandwiches, place small wrapped gift boxes and/or glass ornaments on it. Consider also a gold or silver fruit shaped candle or two on the top plate. Potpourri Plate: Get an attractive large shallow plate or bowl. Place a wide pillar candle in the middle and surround with a great smelling potpourri that has large pieces of cinnamon stick, dried fruit, seed pods, berries, etc for visual interest. Candle Plate: Or how about an attractive shallow plate, bowl or tray. Place in it 3 novelty shaped candles such as ornaments, Christmas trees, fruit, etc. Surround with some small pine cones of various sizes or greenery. to the stem of bowl or around bottom of candle holder. different heights, etc, with votive candles or some with floating candles, some with floating flowers. Add a bit of ribbon tied around the stems or surround with some greenery. Look for stemware in thrift or discount stores or flea markets.